Reclaiming our Futures Alliance (ROFA) is an alliance of Disabled People’s Organisations. We fight for equality for Disabled people in England. 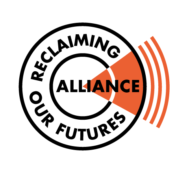 The Reclaiming Our Futures Alliance (ROFA) is an alliance of Disabled People’s Organisations (DPOs) who have joined together to defend disabled people’s rights and campaign for an inclusive society. ROFA fights for equality for Disabled people in England and works with sister organisations across the UK in the tradition of the international disability movement.